Come and enjoy spring with us! 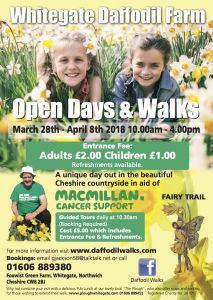 The 2018 Daffodil Walks flyer is here for you to download and print for yourself – please share with friends or put up a copy for your local groups to see! This entry was posted in Talks, Walks. Bookmark the permalink. Site hosted at 34sp.com, highly recommended for professional hosting & domains!